Astro completed his first graffiti works in the northern suburbs of Paris in 2000. At first this self-taught and passionate artist concentrated on text and the wild style before progressing his capacities and techniques towards an abstract style combining curves, calligraphy and dynamic forms. Inspired by artists such as Hartung, Vasarely and Mucha, Astro created his own universe working with the subtle nature of shadow and light, the power of colour and perspectives. 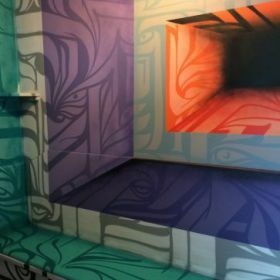 Astro's typical spontaneous and impulsive lines trick the eye of the onlooker warping the flat surfaces of building facades and canvasses, creating impressive optical illusions. A work which applies equally well to walls as to canvas, and now also to cling-film thanks to the new technique known as "cellograff" which he developed in 2006 with Kanos. His energy and originality make him an essential artist in the street art scene. He is currently part of the Los Angeles CBS collective.